AgingCare.com is where caregivers discover that they are not alone, how to survive, and how to provide the care their loved one needs. Notes: Grief support for children, teens, parents and other adults Meet at Broadmoor Baptist Church on Youree. Call Leigh for starting dates. It is 10 week series that meets once a week. Notes: 5:30pm - 1st Thursday of each month. Located at the Glen Retirement Center Stiles Dining Room. Notes: Meets the 2nd Thursday of each month at 6:00pm. 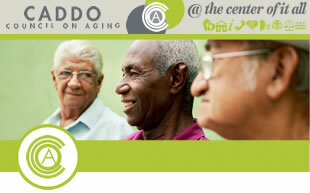 The location is at the Senior Care Group Therapy Room, 5th floor. Notes: This group meets every 3rd Tuesday at 2:00pm. Heritage Manor South is the location. Notes: 5:30pm - Thursdays. Located at Willis Knighton Greenwood Road. One-Story Bldg, btwn Cancer Center and Eye Clinic. 2:00 - 4:00 pm - 1st Sunday Each Month. Located at the Brentwood Hospital Gym. Notes: The CHRISTUS Shumpert Cancer Treatment Center offers two support groups: A general support group for survivors and families meets every Thursday at noon in the Cancer Treatment Center conference room. For more information, call (318) 681-4140. 2510 Bert Kouns Conf. Room B. Notes: 6pm - 3rd Thursday of each month. Located at Willis Knighton South. for those caring for persons with Alzheimer's or other memory loss related illnesses. 403 East Flournoy Lucas Rd. Notes: First Thursday of each month, 5:30-6:30pm at The Glen Retirement System. Notes: Meet Thursday at noon, Conference Room, Cancer Treatment Center. Notes: Meets at Willis Knighton Heart Institute first floor, off Hearne Ave., the third Thursday from noon to 1 pm. Notes: It is held first Monday of the month at 6:30 pm Please call us for more information. Everyone is welcome. Notes: The Meeting time varies - call for times. Notes: Meet - 1st Tuesday of each month at 6:30 pm, in parlor. Meets third Monday of each month. Notes: Meeting times vary, call for schedule. Notes: 7:00pm - 4th Wednesday of each month. Located at the Broadmoor Branch Library Community Room. Notes: Meets the 2nd Saturday of each month at 1:30pm at the Bossier Library.We are there to support each other. Both the patient and the caregivers/family members are invited to come. We have speakers at many of the meetings. Notes: We are a volunteer-based health organization dedicated to providing education, information, support, and advocacy for people who have had or will have intestinal or urinary diversions. Monthy support group Meeeting, Information, Visitation and advocacy. Meets: 2nd Sunday each Month. Ryan Room at Schumpert Hospital from 2-3 pm, except in May. Notes: Monthly Support Groups - Guest Speakers on Related Topics, Individual & Family Counseling.